I understand the motives behind this, but I feel like it does a disservice to the victims of the Holocaust. 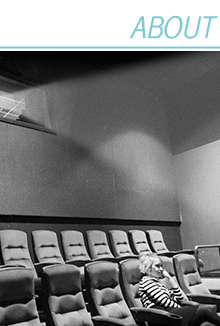 I think it also wildly underestimates moviegoers' capacity for empathy. 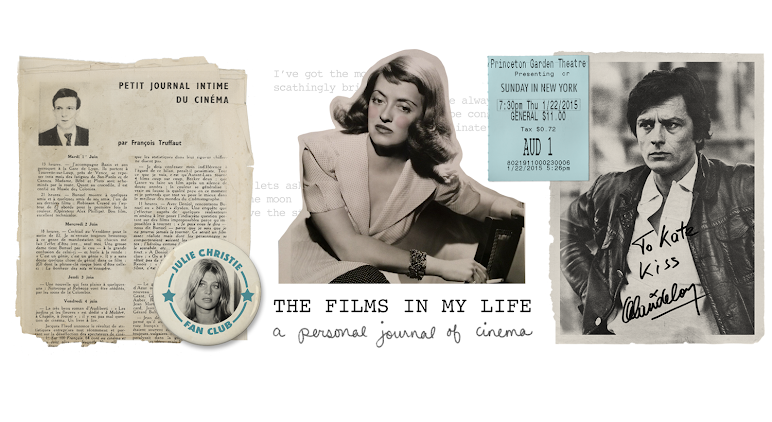 We can relate to characters who don't share our background, and, at least in my opinion, when something horrible happens to someone in a movie I don't need to know that their makeup was the same as mine to feel their pain. And knowing their makeup was different from mine doesn't lessen that pain in the slightest. 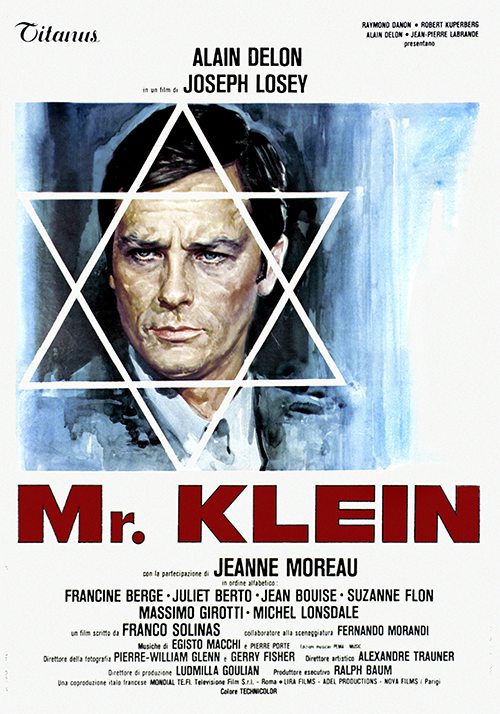 Mr. Klein (1976) is about a French-Catholic protagonist who is mistaken for a Jew who shares his name. Although it falls into one of the categories that I mentioned above (#3) it doesn't strike me as a movie that was simply trying to light fire in the bellies of emotionally vapid moviegoers. Alain Delon plays Robert Klein, a Christian art dealer in occupied France who buys paintings at dirt-cheap prices from Jews who are being forced to sell their belongings. When a Jewish newspaper shows up on his doorstep it starts a series of events that make Klein question his own identity, often seeming to flip back and forth between denial (even when he's thrown on a bus as part of the Vel' d'Hiv Roundup he adamantly declares that this has nothing to do with him, as if everyone else on the bus *should* be there, while he shouldn't) and doubt (what about that Danish side of the Klein family tree? what if he really is Jewish?) Rather than just asking the audience to relate to a non-Jewish victim of the Holocaust, Mr. Klein creates an ambiguous character who literally could be ANYONE. He could be the French-Catholic art dealer, or he could be the Jewish resistance fighter who shares his name. He could be a man with some Jewish heritage or a man with none at all. His identity doesn't belong to him anymore, it was reduced to a series of missing documents and physical measurements. Aside from the political nature of the film, it's also an incredibly suspenseful mystery and an interesting treatise on the nature of obsession. Mr. Klein was directed by Joseph Losey, who also directed two of my favorite Dirk Bogarde movies, Accident and The Servant. I love his directorial style and it suits this movie so well. I'm not very good at describing what I love about filmmakers but I just love his camerawork and the atmosphere he creates in his films. I'll be thinking about this movie for a long time. It's interesting on so many levels and honestly every aspect of it was perfect. I've been on an Alain Delon binge recently, which (I know for a fact) sometimes clouds my judgement on acting quality but he was seriously amazing as Robert Klein. He brings a kind of detached obsessiveness to this role that could have easily been played over-the-top by someone else. I have so many more thoughts, but I'll leave it here since this is already getting too long. I'd definitely recommend watching this if you get a chance. Even if you're not interested in Holocaust-related cinema, it's a haunting psychological thriller that deserves to be seen. I've never heard of this, and will definitely give it a look! I also feel like Holocaust movies tend to play on expected feelings and modern-day hindsight, and that they become stale or overwrought accordingly. I look forward to seeing what Alain Delon brings to this role; I'm a big fan. Delon is my favorite actor. You described Mr Klein the way i felt about it. The acting, the camera work , the lighting, especially when he stands in front of that Asian painting, half his face is lit.. Stunning! I've been binging on him lately too. When he steps on screen, it's like the 4th of July for me.